Teaching reading to children in a language that is not their own is a daunting task. Combining the best classroom practices and research on teaching reading and language acquisition, Mary Cappellini integrates effective reading instruction with effective language instruction. Through the framework of a balanced reading program, she emphasizes the importance of constantly listening for and assessing children's language and reading strategies during read aloud, shared reading, guided reading, and independent reading, including literature circles.Mary plans and demonstrates whole-class, small-group, and individual reading instruction using a model of "reading to, with, and by children" with fiction and nonfiction texts. She works in the primary and upper grades with children at all stages of English language development and at all developmental reading levels. With on-going assessments based on those interactions, she shows how to plan for more effective instruction. Mary constantly questions and discusses whether the child needs more support in language development or in developing reading strategies, breaking down assumptions that equate a low level of English proficiency with a lack of reading strategies, or English language fluency with accomplished reading skills.Through the use of wonderful literature, and by maintaining a focus on the children's strengths, needs, prior knowledge, and interests, Mary constantly challenges students as they develop their fluency in English while becoming fluent readers. extensive resources: numerous forms and checklists—observation sheets, planning sheets, literature response sheets, focus sheets for shared and guided reading, and more. Also included are lists of books for read alouds, shared reading, and thematic units, and lists of recommended guided reading series appropriate for English language learners. 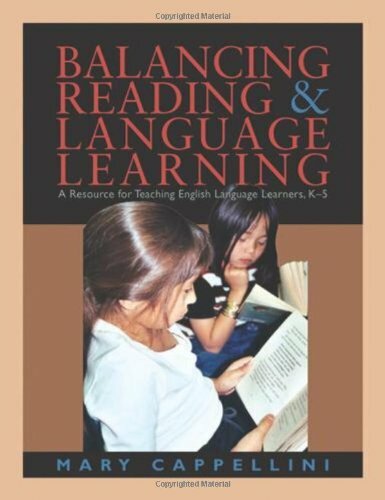 Balancing Reading and Language Learning provides the strategies proven to be effective in a balanced reading program, while at the same time valuing the native culture and first-language skills of the English language learner. Regardless of how many or how few ELL students a teacher has, this invaluable resource helps them meet the challenges and reap the rewards of teaching children to read as they learn the language. Mary Cappellini is a Bilingual Educational Consultant and a published children's book author who has worked in education for over 30 years. A teacher at heart, she enjoys engaging teachers in reflections and classroom demonstration lessons in her staff development with schools across the country. She works in large urban districts, lectures at prestigious universities, including Columbia's Teachers College, speaks at national conferences, and plans long-term staff development for smaller school districts with bulging ELL populations. "I am hoping that my book, and the staff development I do, helps teachers think more deeply about how their children are developing as speakers as well as readers and writers. We cannot separate language from reading -- they are linked, and therefore, our instruction and our assessment of reading and language development must be linked," Mary explains. Besides her current role as an educational consultant, Mary taught in K-5 classrooms, was a bilingual reading resource teacher and a mentor teacher in the inner city schools of Santa Ana, California, an ESL and 5th grade teacher at the American school in Buenos Aires, Argentina, and taught ESL to adults at Community Colleges as well as worked as an adjunct professor and part time lecturer at California State Universities and UCs. A native of California, Mary still lives in Orange County where she grew up. Although she lived most of her life in California, she also lived in Spain and in Argentina, where she met her husband. Her bilingual family includes three daughters, and she says: "We travel as often as we can, visiting families on two continents." Besides consulting and traveling, she continues to write children's books in both English and Spanish and volunteers teaching ESL to recent immigrants in an after school youth program at Save Our Youth (SOY), a nonprofit in Costa Mesa, California, where she also serves as a board member.